I’ve been using paint to transform spaces for many years now. It’s an affordable option when it comes to design and can be the most impactful part of any room. Below are some examples of what can be done with a few sample paints. Painting around the exterior of the door created an interesting focal point and made the entrance feel larger. By painting the trim around the door it made it feel wider and taller. The color blocking added some extra visual interest. A fun and colorful mural with the addition of plywood shapes and palm leaves made of yarn wrapped around nails. Before the pink shapes and yarn leaves this wall was a jungle mural. That’s another perk of paint. Change your mind? Paint over it! The stripes on this wall were drawn with a paint pen. Just a few simple lines of different widths. Another design done with a paint marker, all you need is patience. To get perfect circles hammer a nail into the wall where you want the center of the circle to be. Next take a string and tie it around the nail and cut it to the length of how big you would like to circle to be. Pull the string taut from the nail and trace the circle with a pencil at the end of the string. Simple color blocking with a strip of paint across the mirror. Little details that can make a space unique. It doesn’t get easier than this, these simple triangles really added a lot to this space. One of my favorites, the flamingo wall. Outlined with a gold paint pen and filled in with several shades of pink sample paint. I painted some miniature flamingos in the RV but they only lasted a day before they were painted over. This wall painting was inspired by the art hanging to the right and extended on to the wall. Big palm leaves, big impact, little cost. Lastly, a floor mural. This room is very low traffic so I used regular wall sample paint but if it were a high traffic area I would seal with clear coat or use floor paint. 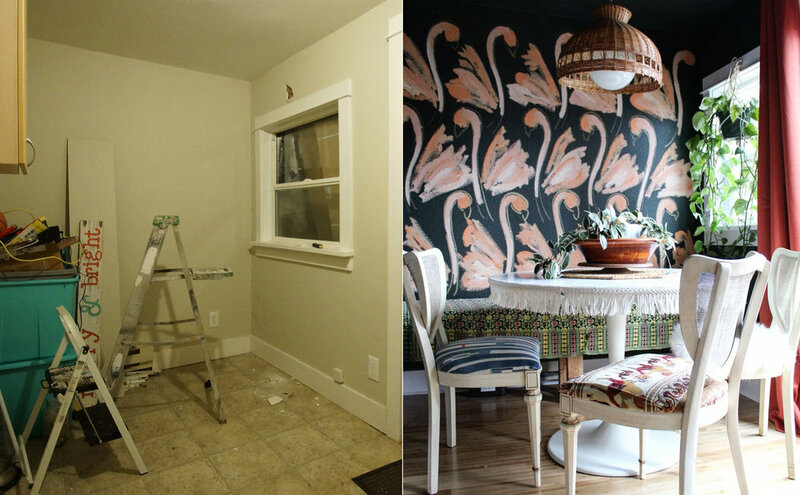 I often reminisce about the homes we used to live in and realized that one of the best transformations we’ve worked on was never documented on here! Our old home in Portland, Oregon had a small room in the back of the house that was meant to be a laundry room. It was dark, dingy and a complete waste of space. We decided to turn it into a combo laundry and dining nook. Tim and I (with the help of a few friends) did all the work ourselves. 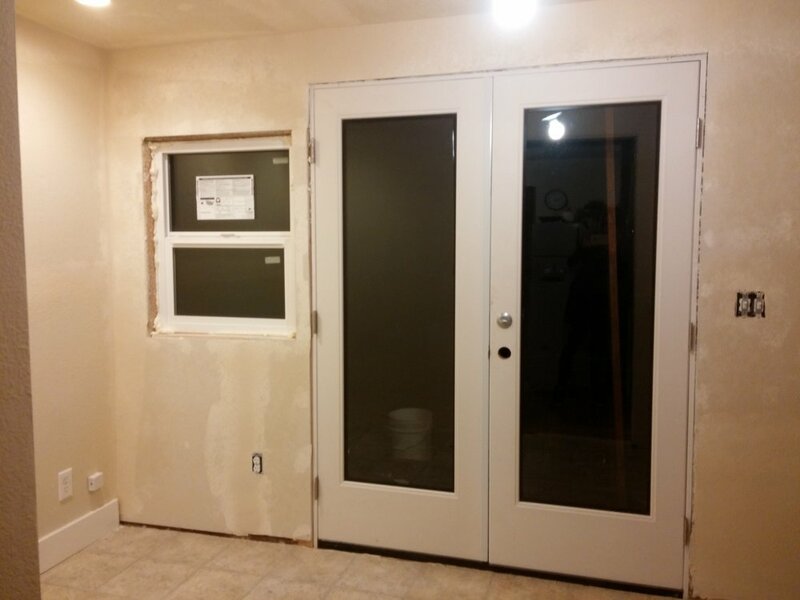 The first thing we did was replace the solid door with glass french doors to let in more light. We moved the washer/dryer to one side of the room, stacked it, and installed sound muffling doors. Lastly, we laid down new bamboo flooring. I painted the whole room dark green, hand painted the flamingo wall and voila, a whole new room.